Firm 20-30 mmHg. 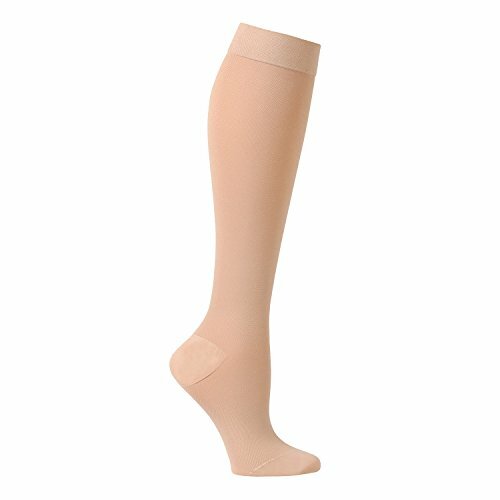 Support Opaque Knee High, Petite Height, Regular Calf- Non-binding and long wearing, soft knit provides good cosmetic cover up, all-season warmth. Very durable, graduated compression. Non-elastic reinforced heel and toe. Measure first thing in the morning before swelling occurs. 80% Nylon, 20% Lycra(r). ATTRACTIVE STOCKINGS WITH BENEFITS - Fashionable closed toe stockings with a non-elastic reinforced heel and toe. Non-binding and long wearing, soft knit provides good cosmetic cover up and all-season warmth. Fits petite sizes. FIRM COMPRESSION - Hose feature 20-30 mmHg of compression that helps prevent deep vein thrombosis (DVT), and is used in post-surgical and post-sclerotherapy treatment to help prevent and relieve moderate to severe varicose veins (even during pregnancy). IMPROVE YOUR LEG HEALTH - Firm compression aids in treatment of moderate to severe edema or lymphatic edema and helps with the management of active ulcers and manifestations of post-thrombotic syndrome (PTS). PREVENT SERIOUS CONDITIONS - Can help prevent orthostatic hypotension (sudden fall in blood pressure when standing) and relieve superficial thrombophlebitis. SIZING - 80% Nylon, 20% Lycra hose available in Black or Beige. Select small, Medium, Large, and XL. See size chart to find your perfect fit. Measure first thing in the morning before swelling occurs. If you have any questions about this product by SUPPORT PLUS, contact us by completing and submitting the form below. If you are looking for a specif part number, please include it with your message.